Every year at the Cannes Film Festival, excluding 2009, people complain that the films selected for the Main Competition are weak, but this year brought new meaning to the collective ennui shared by critics, press and the general public. While some say Cannes was awash with unwatchable art house fodder, there were some notable exceptions. Much of the fiction fare was considered bland, self-indulgent or just plain ridiculous, but there were many serious and engaging documentaries that got audiences fired up and indignant. Former CIA agent Valery Plame appeared more closely aligned with Lucy Walker's Countdown to Zero, but she walked le tapis rouge with her screen persona, Naomi Watts, for Doug Liman's Fair Game. While Oliver Stone's Money Never Sleeps was dismissed as "useless and more embarrassing than his first Wall Street," documentaries treating the same topic fascinated audiences and were extensively examined in the media. 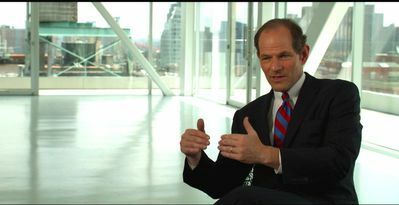 Highest ranking was Charles Ferguson's Inside Job, in the Special Screenings category. Anyone who saw Ferguson's Academy Award-nominated No End in Sight might expect the same intelligent and rigorous investigation, followed by a strong, coherent analysis of the subject, and they'll not be disappointed. Inside Job, which Sony Pictures Classics will distribute this fall, explains not only how deregulation helped create "an increasingly criminal industry" that produced a series of financial crises, but also the specific events responsible for the global financial meltdown in 2008. "It was no accident," says Ferguson. "It was a completely avoidable crisis." Interviews with lobbyists, investment bankers, financial insiders, politicians, journalists, government officials in the pockets of Wall Street, university and business school professors who are on the Federal Reserve Board reveal the extent of collaboration and corruption not only within the US government, but also in its financial and academic institutions. Sundance audiences in January, is a call to abandon nuclear arms. The evidence shows that a nuclear catastrophe will occur in the near future. Plame attended screenings and described her role in the CIA, before she was outed by the Bush team: to prevent rogue states with terrorist intentions from getting their hands on these very lethal weapons. With Draquila-Italy Trembles, fearless Italian comedienne, author, director and TV personality Sabina Guzzanti delivers a caustic inquiry into the corruption, Mafia connections, blackmail, government swindle and political scandals that define Silvio Berlusconi's authoritarian rule. She describes the lethargy of the political classes, the cowardice of the media and the impotence of Italian citizens. 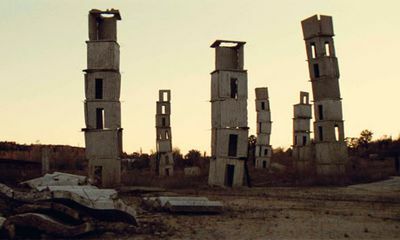 Following her 2005 film Viva Zapatero, which detailed the steady erosion of freedom of expression in her country, Draquila- Italy Trembles revisits the scene of the April 2009 earthquake and the bureaucratic bungling which left victims helpless and without shelter for more than six months. Most alarming is the creation, thanks to Berlusconi, of a new, extremely powerful "Civil Protection Authority" that nobody knows much about, but exists like a parallel state with sweeping powers to bypass or overturn the law. Sophie Fiennes' Over Your Cities Grass Will Grow explores the work and creative process of 65-year-old German artist Anselm Kiefer within the universe he built at La Ribotte in the south of France. His studio workshop spans over a 35-hectare landscape of elaborate art installations, 48 buildings, twisting towers, bridges, lakes, grottos, forests and a labyrinth of tunnels. The film has few words; cinematographer Remko Schnorr studies the light, shapes and textures; and the music, by Jorg Widmann and Gyorgy Ligeti, and sound design, by Bram Boers, lend an appropriate aural texture But for such a fascinating portrait of an artist, only France and the Netherlands supported Britain's Sophie Fiennes with financing for her film. Thanks to Cannes, Fiennes' film received well deserved praise and recognition. Sacher in Italy, Sejong Communications in South Korea and Shapira Films in Israel. 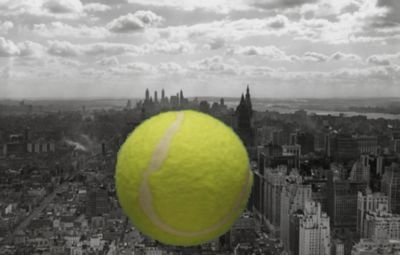 a moveable feast for eyes and ears. However, the record company's decision to open and close the film with unnecessary and irrelevant sound bites from non-significant recording artists, as if to validate the film to a younger audience, shows how truly out of touch the music industry is. 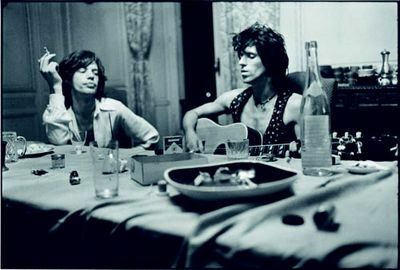 Mick Jagger and Keith Richards. From Stephen Kijak's Stones in Exile. Frederick Wiseman has a large, loyal following in Europe, particularly in France, where his La Danse, about the Paris Opera Ballet, was so lovingly admired, it competed for Best Documentary in the 2010 Cesars. Screening in the Director's Fortnight, Boxing Gym, which has very little dialogue, is a bit of a departure from the youthful octogenarian's storytelling style, but a syncopated rhythm of leather mitts beating on punching bags provides a kind of musical score. In what appears to be a derelict warehouse somewhere in Austin, Texas, a cross-section of society congregates and transforms the place into a hub of human activity. The film's beauty and power comes from John Davey's steady, thoughtful, observant camera. Wiseman's sharp editing has a beat, a rhythm and a pacing that energizes. Equally entertaining were pre- and post-screening discussions with Wiseman at the American Pavilion, where he explained the technical and aesthetic aspects of his work: the advantages of editing on Moviola versus an Avid, his preference for film over digital or hi-def, and the themes that link his body of work. In fluent French, Wiseman explained the six-month process of whittling down 60 hours of dailies into the marvelous 90-minute Boxing Gym. 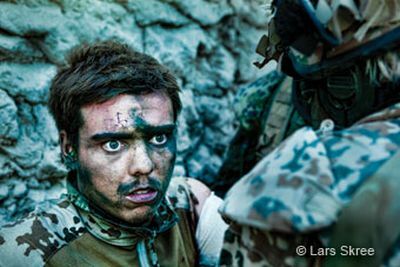 Lars Skree risked their lives but kept the camera running throughout to record daily life. Frustrated that they cannot tell the difference between an Afghan who tends his goats and an Afghan member of the Taliban who tends his grenades, the soldiers gradually realize the futility of their mission. Only after the company is ambushed do good intentions fade away, and when the soldiers openly express the thrill, excitement and adrenalin rush of killing, the outraged and embarrassed military protests, and the nation debates the ethics of "killing for peace." cheaper than a nuclear weapon..."--at which point, the great and the good of the French film industry, including Gilles Jacob, Thierry Fremaux, Juliette Binoche, Costa-Gavras, Frederic Mitterand and Jack Lang, along with Toscan de Plantier's family members, burst into thunderous applause. The African Queen and The Red Shoes. Cardiff was the preferred cameraman among Hollywood's greatest leading ladies--Marlene Dietrich, Ava Gardner, Marilyn Monroe, Audrey Hepburn--but he was also a director in his own right. The most interesting section of the film is when Cardiff demonstrates how his lighting style imitated the light on canvases of Dutch and Flemish master painters. Women Are Heroes, which screened in the Critic's Week category, shows us women from all over the world whose lives have been ravaged or broken, but who are determined to lift themselves up. Despite the criticism of a lack of narrative, the film is worthy for its empowering message alone, taking viewers to favelas in Rio de Janeiro, shantytowns in Kenya, fields in Cambodia and villages in Rwanda and India to hear women tell of the impact on their lives after seeing gigantic photographs of their faces painted on bridges, trains, sides of buildings... "I will not remain the way I am, I will improve myself"..."Seeing my photo on the front of a building means someone is interested in you, means you are someone important." Reactions on the faces of the men are equally revealing. With so much going on almost round the clock at both the festival and market during those hectic 11 days in May, Cannes is a real challenge to one's health and sanity. The pressure to absorb the most from each day eats away the possibility of getting proper sleep each night. Almost thankful when it's time to leave, and the exhaustion, headaches and sneezing fits kick in, you float into that semi-dream state of lingering memories of those exotic characters, strange lives and unusual stories. You keep wondering where they are now and what they are doing. It makes it all worthwhile. Madelyn Grace Most works as a journalist at the Foreign Press Association in Paris and as a painter and photographer in Normandy, where she is part of the organizing committee of the Dieppe International Film Festival.